It’s only February, and we’ve already seen the most high-profile Modern event of the year. Pro Tour Rivals of Ixalan went totally according to plan: no Eye of Ugin shenanigans; no team of baby-genius-pros breaking the format in half; no flurry of bans raining down on the winning deck. So, business as usual, right? Wrong! The Pro Tour was still donkey’s-exciting, thanks in no small part to the sweet decks and breakout cards of the tournament. Today, I’ll look closely at the 2nd, 3rd, and 4th-place decks—all relatively rogue flavors—as well as the cards that defined Pro Tour Rivals of Ixalan, telling the tournament’s story my way: through its tech. These three decks aren’t the Pro Tour’s most-played decks. Nor are they its best-finishing ones—at least, not without discounting the tournament’s actual winning deck. Rather, Mardu Tokens, UR Pyromancer, and BR Hollow One mark the first serious outing for a suite of decks that have been bubbling under the scene for months now. The Pro Tour just outfitted them with the credibility needed to seduce lower-level Modern players. We’ll probably see plenty more of each archetype in Modern. For now, let’s break down their respective aspects. One deck, many names: Mardu Pyromancer; Mardu Reveler; Mardu Tokens. No matter what you call it, this deck is real! We’ve suspected such for months now, as selfiesek and his mysterious gang of devotees quietly murdered Magic: Online leagues with the thing. But just as it apparently takes Elvis to move rock records or Eminem to push rap into the mainstream, so too must a pro first succeed with a Modern deck to snap it into common consciousness. I’m a fan of most changes Gerry Thompson made to the established deck, which overall just make it cleaner. He trims Lightning Helix altogether, keeping only Lingering Souls in white, and moves a second Blood Moon to the mainboard. Gone, too, is Monastery Swiftspear—the two copies always seemed strange to me in selfiesek’s list, and I opted to max out on them and cut Young Pyromancer from my Shadow-inclusive build. It seems Gerry had a better idea in preserving the Shaman over the Monk, catching wind early of the 2/1’s sudden relevance. One thing I find interesting about this build is its reliance on Faithless Looting and Bedlam Reveler to dig into silver bullets. Both the main and the side feature surgical answers to problem permanents, including Dreadbore and Anger of the Gods. Looting/Reveler is certainly a powerful draw engine, and I like that Gerry recognizes that enough to build Mardu Tokens, well, like a blue deck. We’ve seen this deck pop up in Modern time and again, but with varying win conditions: Delver of Secrets; Madcap Experiment; Through the Breach; Batterskull; hell, Splinter Twin. Seasoned Moderners just call it “Blue Moon.” Except, weird thing: Vieren’s 3rd-place deck doesn’t actually play Blood Moon. It plays Field of Ruin! The first thing that struck me when I saw Pascal’s decklist was its inclusion of Thing in the Ice. Thing has never seen serious play in Modern, and for good reason; it doesn’t immediately warp the red zone like Tarmogoyf, and dies to the same removal spells. It also demands a shell centered around instants and sorceries, which doesn’t really exist (see: lack of Delver in the format). To add insult to injury, Fatal Push removes Thing scot-free at any time. To its credit, Thing does plug a hole long felt by UR strategies: the inability to remove large creatures. Thing indeed removes them, all while doubling as one itself. The trouble, then, lies in the transformation process. One new card that helps tremendously on this front is Opt, a cantrip that joins Serum Visions to make flipping Thing a trivial affair. 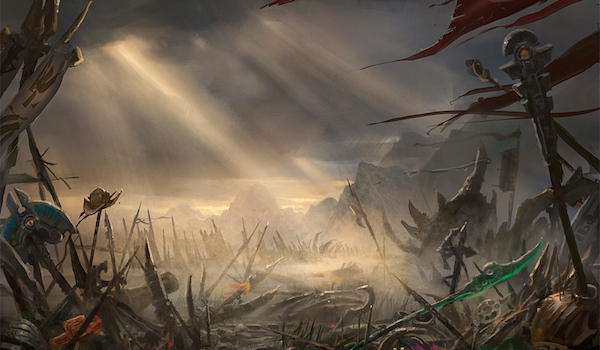 The threat of an instant-speed flip also looms larger with Opt in the mix, complicating tricks like Temur Battle Rage or other creature-based combos. Overall, though, Thing makes the cut because it’s a highly compact win condition, as is Young Pyromancer, that attacks from a different angle: it goes tall rather than wide. The two creatures also demand the same condition be fulfilled: that their caster also casts lots of instants and sorceries. Their similarity here allows for a streamlining of the deck. 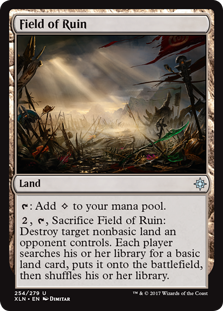 Field of Ruin is rapidly shaping up to be one of the best utility lands in the format. It turns out many slower decks could have accommodated Ghost Quarter, and would have loved to, if not for its unfortunate condition of eating a land drop. Since Field immediately replaces itself, these decks are rearing their heads and making great use of the pseudo-Wasteland. I mean, Pascal runs it over Blood Moon! I’m sure he cheesed a few players expecting the enchantment during the event. And Field of Ruin itself had one heck of a tournament—but more on that later. This next deck has been through a lot since its introduction to Modern by Julian Grace-Martin at SCG Syracuse last year. It has since dropped green for all but Ancient Grudge in the sideboard, and streamlined its threats and disruption. At Pro Tour Rivals, the BR build Ken Yukuhiro played to the semifinals enjoyed a 100% conversion rate to Day 2. Like the Eye of Ugin-powered Eldrazi decks of old, BR Hollow One seeks to dump huge bodies onto the table at laughable rates and then beat opponents to a pulp while slinging some well-timed disruption. It runs 12 enabler spells to get itself going: Faithless Looting, the best of the bunch for fixing the hand and flashback; Burning Inquiry, a Hollow One-in-a-can that can randomly screw up opponents; and Goblin Lore, which digs the deepest and doesn’t minus, but costs two mana. Bloodghast and Flamewake Phoenix are reliable ways to apply pressure through removal spells, and both generate value when dumped to an enabler. As for its primary threats, Flameblade Adept serves as the deck’s “Delver of Secrets,” a cheap beater that pressures linear opponents while pilots start their engines. After an Inquiry or Lore, Adept even turns on ferocious. Gurmag Angler joins Hollow One as a huge, un-Pushable creature on the cheap. Tasigur also makes an appearance for his affordable mana cost. 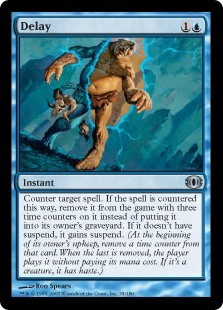 Lightning Bolt and Collective Brutality form the bulk of this deck’s interaction. Post-board, other pieces enter the equation—I especially appreciate BR Hollow One’s easy access to Blood Moon and Grim Lavamancer as hoser cards. The deck mostly struggles against the spell-based combo decks that outspeed it, since it has loads of creature interaction and enough recursive threats to hassle midrange and control. That’s a lot of coverage, but I’ve also experimented with Death’s Shadow and Thoughtseize in this deck to mixed results, and think the pair might merit another look if the metagame trends towards Past in Flames and Ad Nauseam. Every dog has its day, and every Pro Tour has its… well… defining cards. Looting has long been one of my favorite Modern cards—on Nexus alone, I’ve wondered aloud why this “sleeper” doesn’t see more play in red decks seeking consistency, and jammed the card into many shells with Tarmogoyf and Blood Moon. Its time has finally come to play with the big boys… and alongside none other than another of my pet cards, Bedlam Reveler! Of course, the card didn’t just shine in Gerry’s Mardu Tokens deck. It also greased the wheels for a more dedicated graveyard strategy in BR Hollow One. I’d make sure to lock down a set of Lootings pretty quickly now that the cantrip’s on everyone’s radar—it’s a matter of time before Looting finds its way into a shiny new deck you’re interested in playing. We saw the same scenario play out last year with Mishra’s Bauble and Death’s Shadow, both now considerations among an array of Modern decks; Goblin Lore remains pretty niche, but Looting’s got just the mixture of potency and uniqueness Modern demands of its key cards. In “A Fatal Push Retrospect and the Future of Fair,” I wrote about how Fatal Push has changed Modern over the past year. A major takeaway from that article: how the metagame was starting to open itself back up to Lightning Bolt, which seemed like a card with fantastic positioning for the new year. The Pro Tour seems to have vindicated that opinion, with each of the decks showcased above packing four copies of Magic‘s most iconic spell. Even old man Tarmogoyf showed up to the Top 8, a direct result of Lightning Bolt gaining traction. I stand by my opinion that fair, interactive decks badly want access to Bolt in Modern these days. Only Lingering Souls tempts a deviation from red. Modern players perpetually wondering why Sultai “isn’t a thing,” take note! Besides helming Vieren’s impressive UR Pyromancer deck, Field of Ruin wound up in multiple archetypes over the weekend. It replaced Ghost Quarter in BG Rock and UW Control, cameoed in Jon Finkel’s Green Tron deck, and appeared in varying numbers among the Grixis Control lists. Corey Burkhart, the strategy’s poster child, staunchly defended a full four Fields, cutting into his cantrip count to accommodate the land—registering, and excelling with, zero copies of Opt or Serum Visions. Young Pyromancer is one of the most maligned creatures in Modern, not least of all by yours truly. But man, did the little guy have a good weekend. While Pyro’s rate looks bad on paper in the face of Fatal Push, going wide with tokens for just playing Magic is exactly how to beat such efficient spot removal. There’s probably little dissent now about the Shaman’s status as red’s godly two-drop, and we’re likely to see more 1/1 Elementals now than we have since Treasure Cruise. Don’t leave home without your Pyroclasms! 25 years from now, when players tell their grandkids about PT Rivals, Gut Shot probably won’t be the card they obsess over. But the unassuming Phyrexian instant quietly snuck into Humans and Eldrazi Tron sideboards as a way to remove dangerous creatures like Dark Confidant, Signal Pest, and Young Pyromancer without spending mana. The ability to further its own gameplan while disrupting opponents is the biggest strength of the Humans deck, as its creatures attack and block while casting troublesome spells. Eldrazi, too, fights along this axis using Thought-Knot Seer, a huge body with Thoughtseize attached. Gut Shot doubles down on this philosophy, letting pilots conserve their mana for proactive plays without letting opponents develop their own game. Interestingly, of all the free Phyrexian spells, only Gut Shot impacts the board. Also of note is that the card made waves at the last Modern Pro Tour, too, putting 15 copies in the Top 8; that year, it excelled at killing Eldrazi Mimic (and Frank Lepore) in Eldrazi mirrors, and then was never heard from until now. Like Gut Shot, Delay far from defined Bilbao. But it still gave its first eyebrow-raising Modern performance. Despite dodging the Top 8 decklist, Delay was a common choice among Traverse Shadow players, who ran it in the side as a way to hard-answer combo spells and removal alike. Death’s Shadow can close out games so quickly that a little disruption goes a long way—ideally, suspended spells never even hit the stack again. The card boasts extra utility against countermagic (which just fizzles upon second resolution) and flashback spells (notably, Past in Flames and Lingering Souls), and may become a staple of blue-based aggro-combo-control decks going forward. And that’s that: another Modern Pro Tour in the books. Of course it’s easy to say now that things went so smoothly, but I’m thrilled to have the format back on the PT. There’s nowhere now for Modern to go but up! Love the attention to individual cards such as gut shot.